Luke Skywalker and Han Solo make quick work of the door panels and cameras in Detention Block AA-23 during the heart-pounding rescue of Princess Leia in Star Wars: A New Hope. 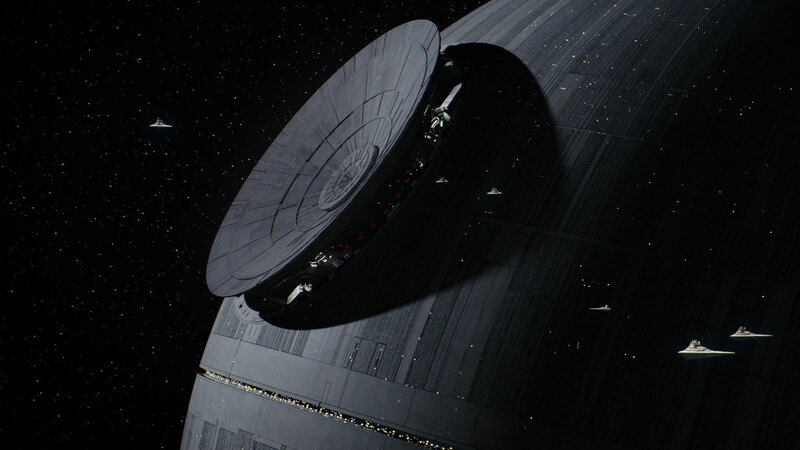 You can copy the Death Star’s striking style in your own home by adding a panel on the wall that looks just like the ones they blast. Instead of opening a cell door, however, this one will switch on your lights! Step 1: Begin by using the air-dry clay to fill the two holes on the blank side of the plate, if desired. 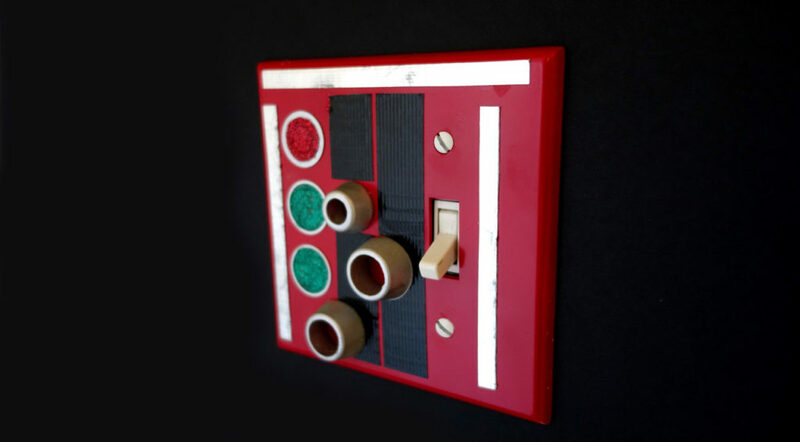 Spray paint the light switch plate red. Set aside and let dry completely. Step 2: Next, spray paint the rubber cone washers and metal washers silver, and let dry completely. Step 3: Cut a strip of the black duct tape about 9 cm. long, or the length of the light switch plate you’re using. Gently stick it to the table you’re working on. 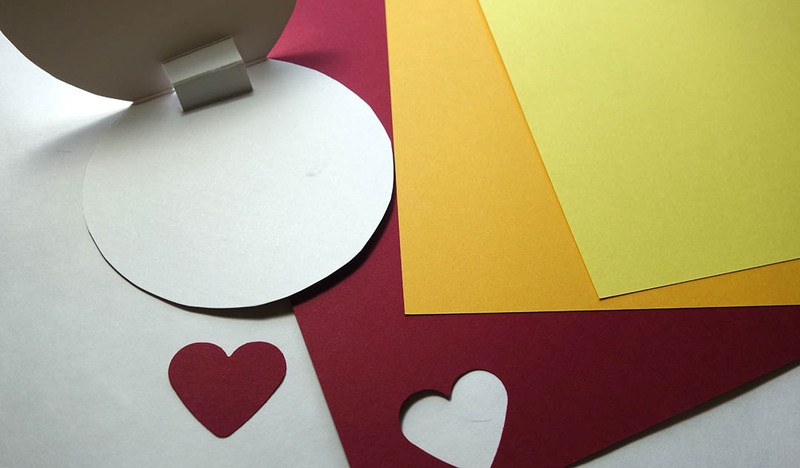 Trace the large rubber cone washer along the side of the tape, and cut out the half-circle. 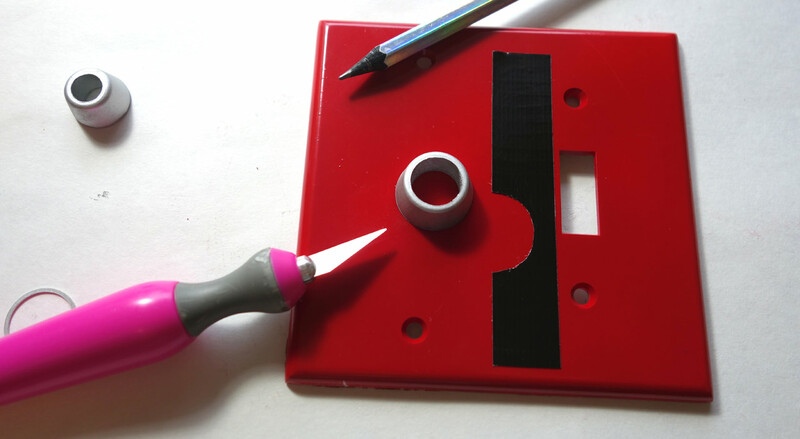 Peel the tape from the table and stick it to the red plate next to the opening for the light switch. Step 4: Cut another 9 cm. piece of black duct tape and lightly stick it to the table. Place the smaller rubber cone washer on the tape and mark the top and bottom. Cut the tape into two pieces, leaving a gap where you marked it. 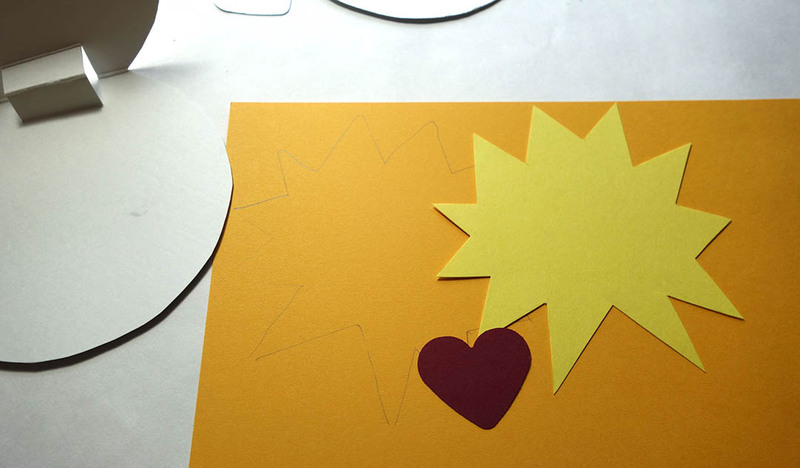 Step 5: Trace the larger cone washer on the bottom piece of tape and cut out a half circle. Line it up with the other half circle you cut previously in the first piece of tape, and stick this tape alongside it. 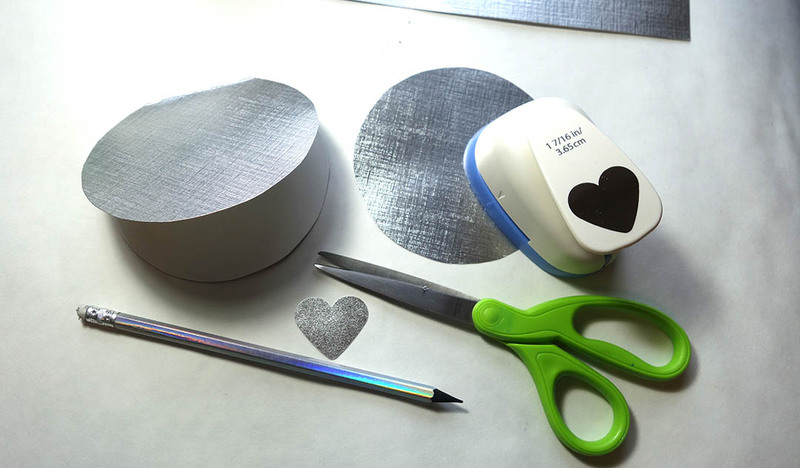 Tip: Peeling and re-sticking the black tape can remove the spray paint from the plastic! 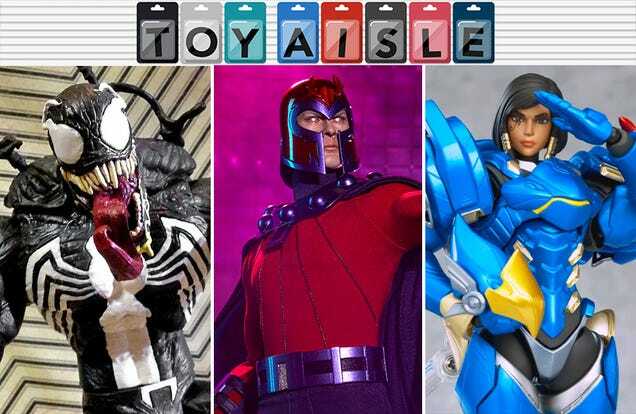 If you’re having trouble lining up the pieces, don’t press too hard on the black tape until you have it where you want it. 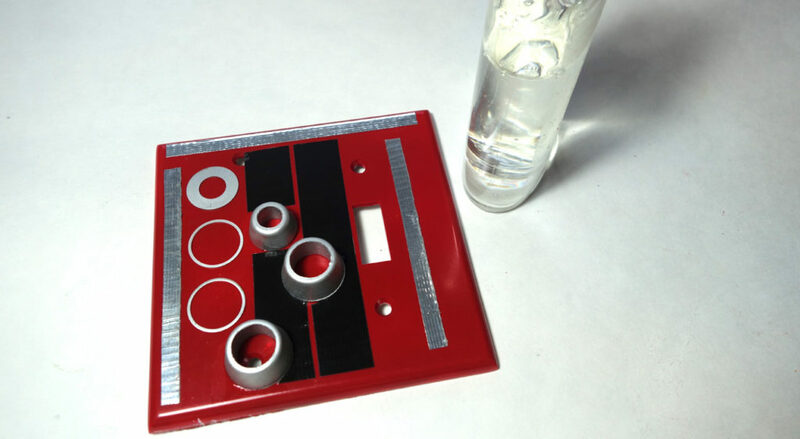 If you do accidentally pull paint from the plate, you can use red acrylic paint to touch it up. 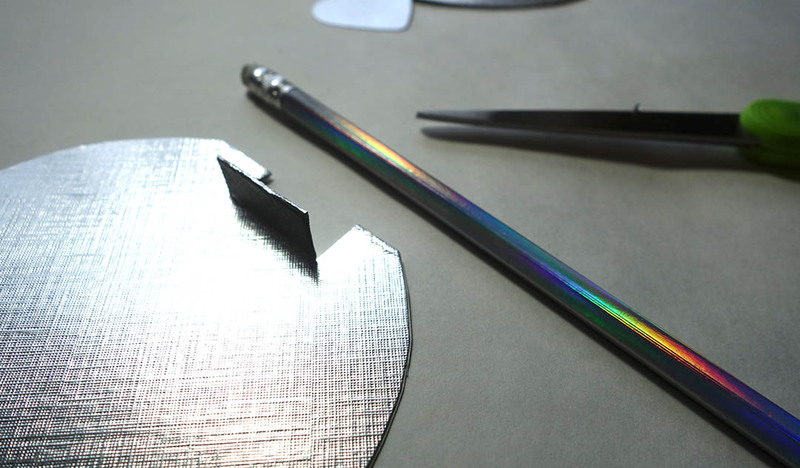 Step 6: Next, cut three thin strips of silver tape the length of the plate. 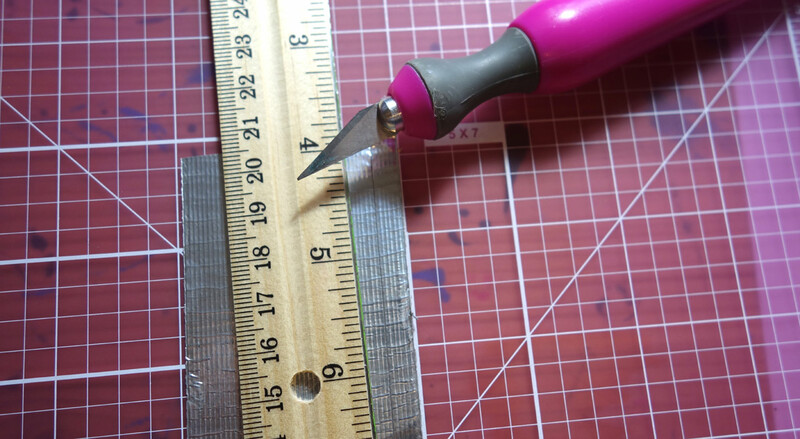 If you’re having trouble making straight cuts, stick the silver tape on a cutting mat and run the craft knife along a ruler. Step 7: Place two silver strips along the left and top edges. Place the remaining strip on the right of the light switch, closer to the switch than to the edge. Step 8: Use the clear glue to glue the cone washers and metal washers to the light switch plate between the black and silver tape on the left side. Step 9: While the glue is drying, paint the screws that came with the light switch plate red. Let dry. 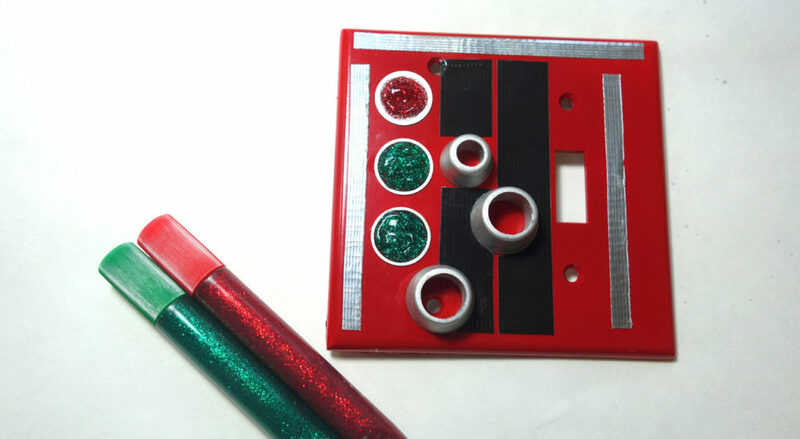 Step 10: Fill the inside of the bottom two ring washers with green glitter glue, and the top one with the red glitter glue. Let dry completely. 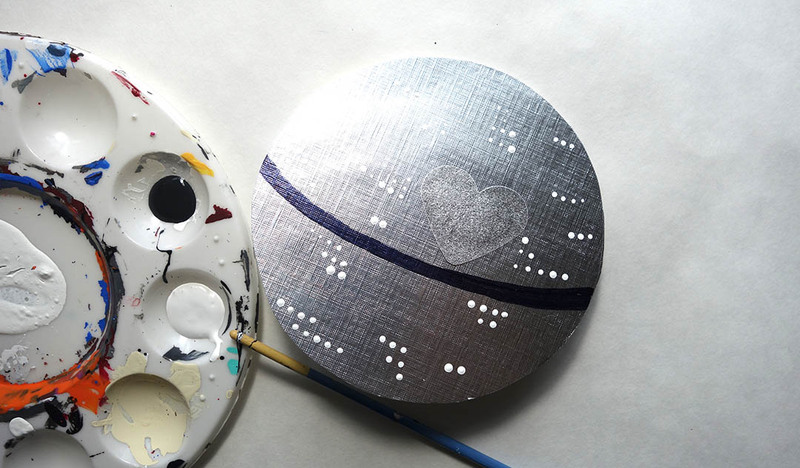 Once all glue and paint are dry, your Death Star light switch is operational! 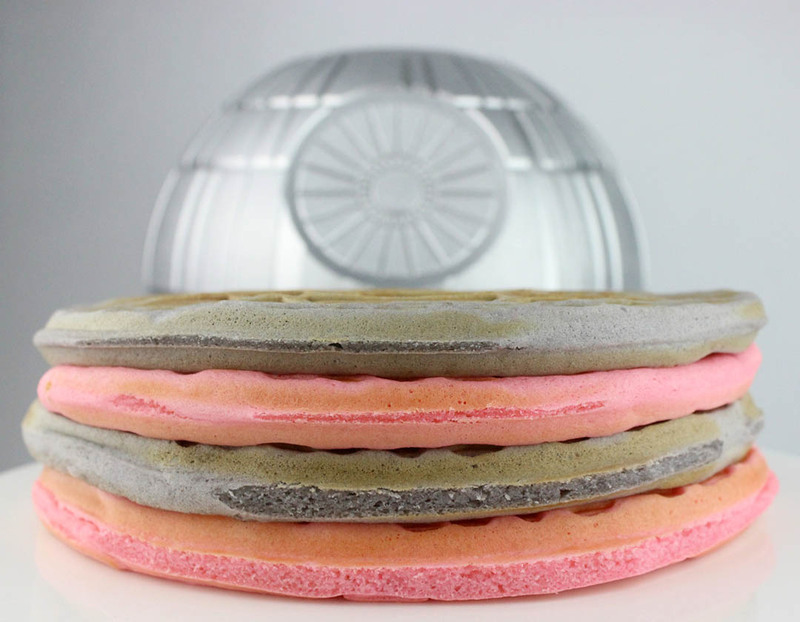 You know the Empire’s motto: if you’re going to make a battle station, why not make a prototype out of waffles first. 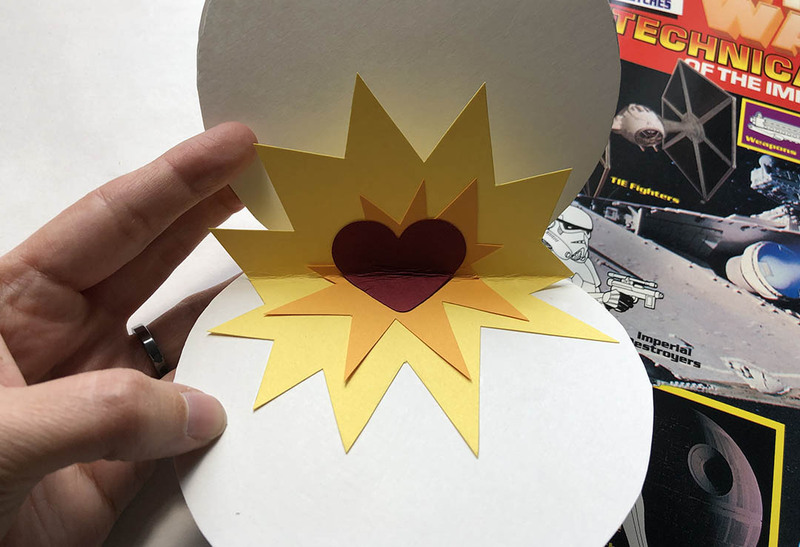 Valentine’s Day is a time of love, even for a moon-sized super weapon. These holiday breakfast treats are tinted to honor the hue of Quadanium steel coupled with the effervescent pink tied to Valentine’s Day. 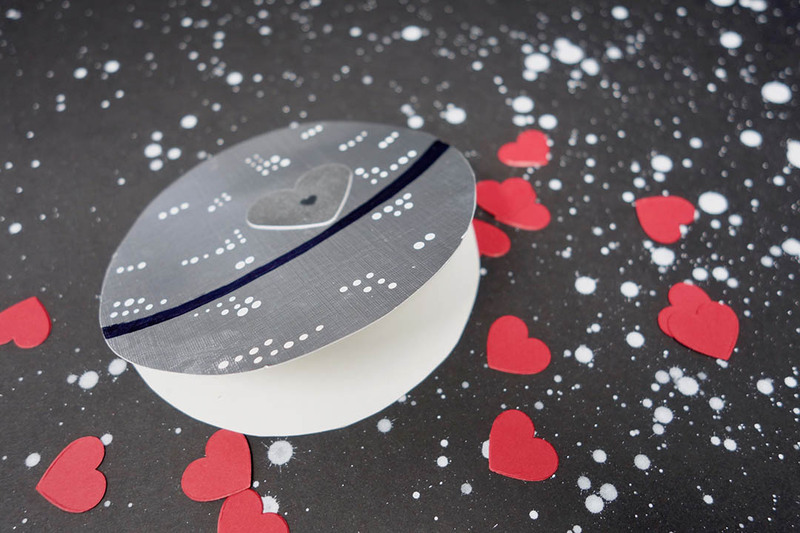 Making these sweet space stations will surely win over your valentine this February 14. 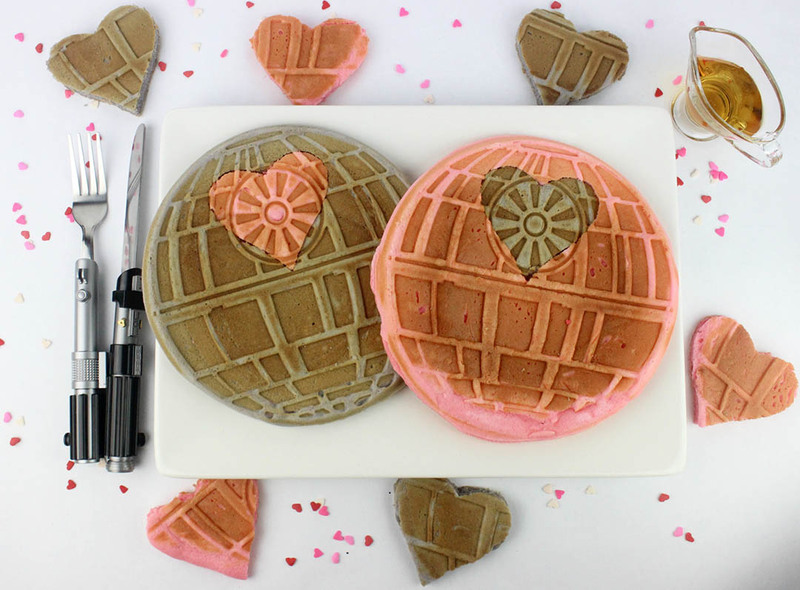 That’s no moon…it’s my heart. Step 1: Prep the waffle iron by greasing generously with non-stick spray. Step 2: In a bowl whisk together the flour, sugar, baking powder and salt. Step 3: Make a well in the center of the dry ingredients then add the buttermilk, eggs, cream cheese, and vanilla. 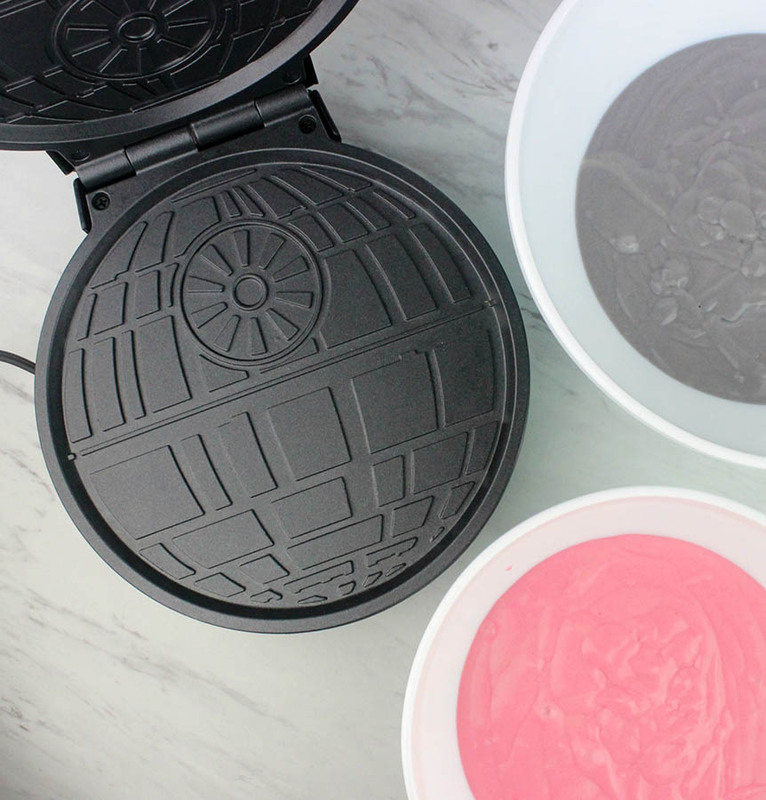 Step 4: Separate the batter equally into two bowls. Into one, add a few drops of pink gel dye until combined. In the second bowl, add a drop of black gel dye, stirring until gray in color. 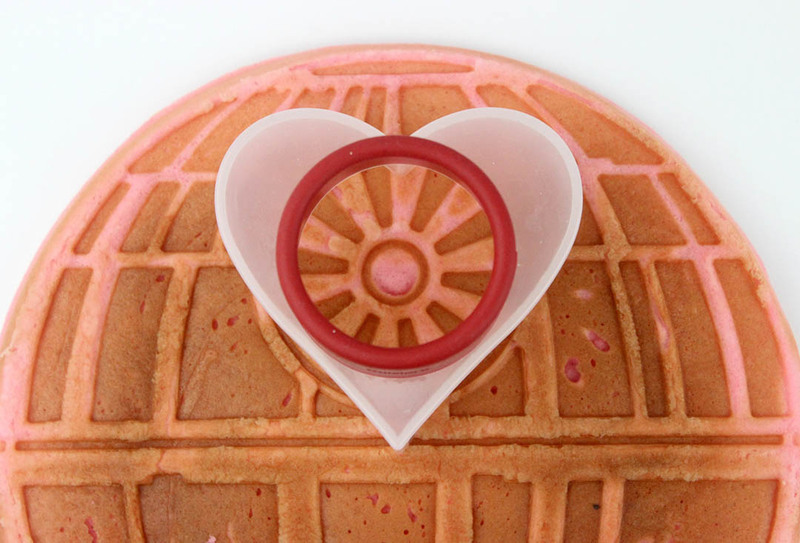 Step 6: Use the heart-shaped cutter to cut out a heart from both a pink waffle and a gray waffle. 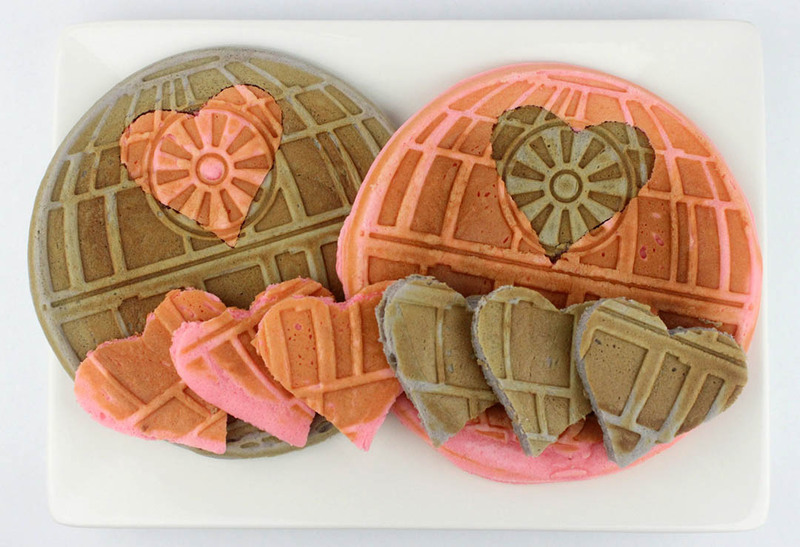 Interchange the hearts in the waffles. Step 7: Serve warm with syrup. 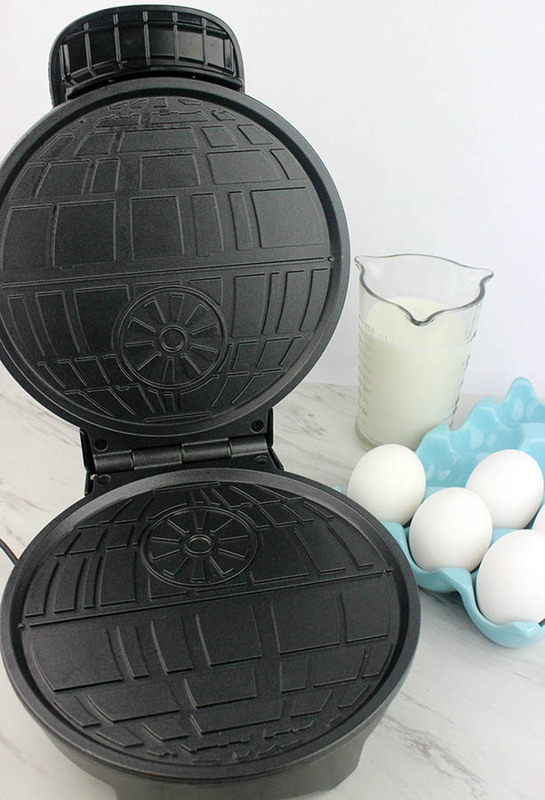 Death Star waffle maker available from ThinkGeek. Lightsaber flatware available at Hot Topic.